It worked locally and on the CI. Finally I gave a 👍 on that comment. 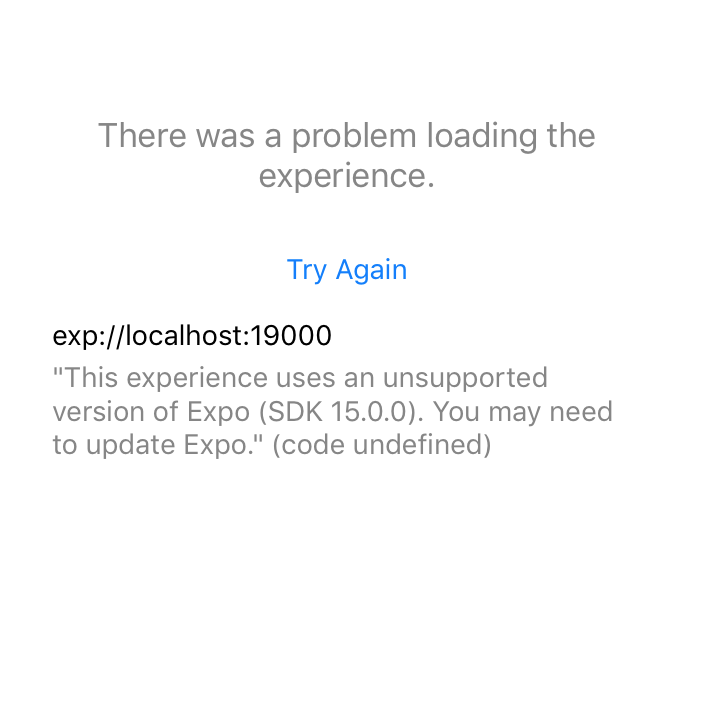 "experience uses an unsupported version of Expo"
If this happens when developing a React Native app with Expo and trying to test it in the iOS Simulator, it means the version of Expo on the iOS Simulator is out of date. This will cause the Expo app on the simulator to reinstall with the latest version. Make sure it only works for the dev enviroment checking the __DEV__ variable. 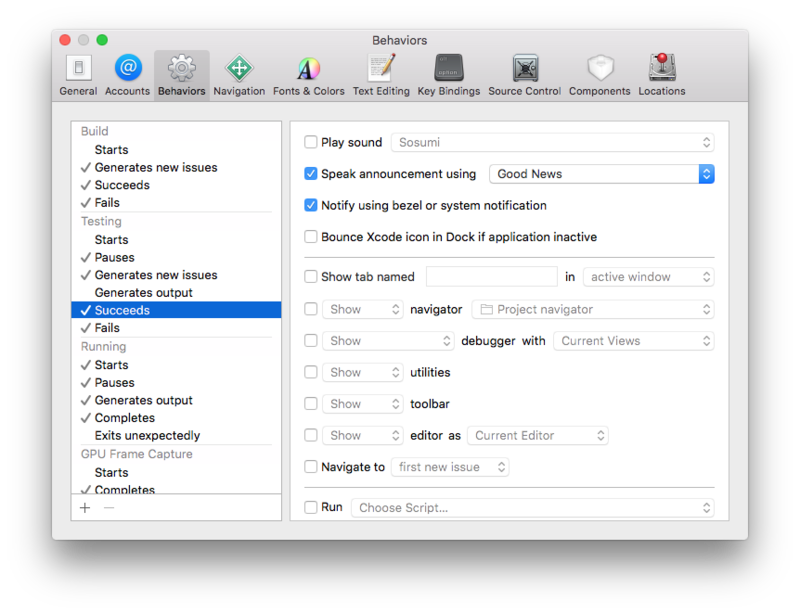 Here I have told Xcode to use the Good News voice to announce when my tests pass. I also picked a voice for passing tests: Bad News seemed appropriate. Comes in handy when you have switched to another application and you happened to miss the notification in the corner of the screen. Plus, it sounds cool. I recently switched over a Phoenix app from the paid Heroku SSL add on to the new SSL beta. Everything seemed to work great, until I noticed all Network Requests from the Android side of my React Native mobile app were failing, however iOS, curl, postman, etc were all fine. I banged my head around for a while and went back to check my SSL set up. During the beta setup, Heroku tells you your certificate is usually a .pem or a .cert. I have both. Without much though, I uploaded the .cert. I went back and uploaded the .pem, and everything works fine. I don’t know why the .pem worked and the .cert didn’t, but I’ll do some digging and post a follow up to this when I know why. but don’t take my word for it, read the official documentation which contains some of the above examples. Note: the pound sign above (＃) is unicode, that is why it is allowed as part of a variable name, whereas normal # sign is not. P.S. to access emojis and other unicode symbols directly in the current edit field press ^⌘+\ on Mac. Xcode scans your code for compiler errors as you type. These errors show up as a red dot in the gutter that can be clicked to reveal the error message. Xcode may also provide a Fix-It that you can accept. When your file contains multiple errors and you want to accept all the Fix-Its, do this: Editor > Fix All in Scope. Better yet, the keyboard shortcut: ctrl + opt + cmd + f.
This feature can be a little unpredictable because while Xcode does a great job of identifying compiler errors, it’s not always great at suggesting fixes. But, when you’re confident that you know what the fix is going to be, it can be very handy to let Xcode help you out. I thought foo was going to be a constant, but then further down the file I realize my mistake - Xcode will error and I’m usually sure that hitting ctrl + opt + cmd + f will switch the let to var for me. public private(set) var bar: String = "hahaha"
foo.bar = "muhahaha" // "Cannot assign to property: 'bar' setter is inaccessible"
So, Foo is a public class with a public String property called bar. This property can be read, but cannot be set from the outside. 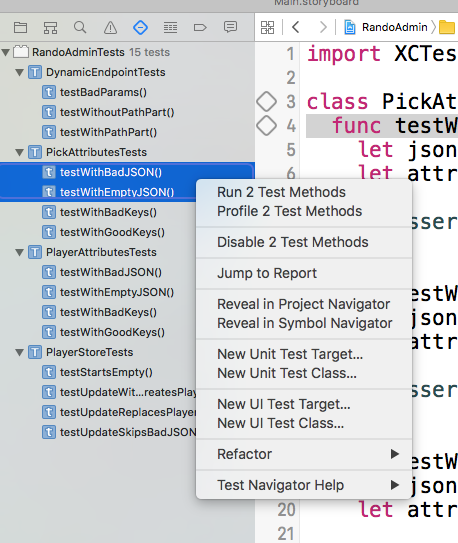 Xcode’s Test Navigator (cmd + 5), is an outline of your tests. As you mouse over the elements in this outline, you’ll see a run button off to the right. Using this button you can pick an individual case, file or target to run. While editing a test file, you can use the buttons in the gutter to run either an individual case or the entire file. We can choose to run both highlighted cases or even disable them. Nice. But, what about keyboard shortcuts?? ctrl + opt + cmd + u - Run the test file currently open. ctrl + opt + cmd + g - Rerun the test(s) you just ran. That last shortcut can be really helpful. Once you’ve run a particular test case in isolation, you can use that shortcut to run it over and over as you work. Joe Groff has a proposal on the mailing list to change this behavior. Credit where credit’s due: I found out about this while reading the excellent Swift Weekly Brief. So far, there is no official implementation for linear gradients in React Native but there is a really cool open source component that implements that for both platforms: Android and iOS. In iOS when you want to clip part of the subviews that are out of the bounds you just set clipsToBounds = YES; in the parent view. In Android you set setClipChildren(true); in the ViewGroup. React Native tries to mimic CSS with their own implementation of it, so you can set the property overflow: 'hidden' in the view’s style. Today I had to integrate a project that I am working on for open source distribution with Cocoapods. I have used this repository manager before but not in swift.